Faf du Plessis has insisted that he and Proteas coach Ottis Gibson have never asked for ‘ridiculous’ home pitches to be prepared, writes KHALID MOHIDIN. Faf du Plessis says the Proteas will be giving youngsters a chance in the ODI series against India. 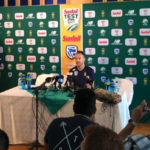 What captain Faf du Plessis had to say on Thursday ahead of the first Test against India at Newlands.